Prior to submitting an application, please carefully review our Granting Guidelines and Eligibility. If you have any remaining questions about completing the application form, about the eligibility of your project, or about the process, please email us, or call Tais McNeill (Grants and Community Knowledge Associate) at 613-236-1616 ext. 223 or Rebecca Aird (Director) at ext. 222. The Ottawa Community Foundation is pleased to once again join the Centre for Social Enterprise Development and other partners to make funding available to social enterprises participating in the 2018/2019 UNCAPPED program. UNCAPPED, which is supported by the Province of Ontario’s Social Enterprise Demonstration Fund, is designed to enable the start-up, growth and scaling of Ottawa-area social enterprises through organizational readiness support, capacity building, and access to funding.If you are considering a grant application to develop, sustain or grow a social enterprise, please contact CSED first to determine if you are eligible to participate in UNCAPPED. Given that OCF is providing grant funding for UNCAPPED projects, we will not accept social enterprise-related applications directly into the Community Grants Program unless they fall outside of the focus of the UNCAPPED program. For new users to the online application system, click here. Carefully follow the instructions provided on the login page. You will receive a confirmation e-mail indicating that you have created a new account. If you have an account already, you can begin a new application by clicking here. To login and modify existing applications, click here. Please read the online application instructions carefully. The online application system will require that you enter your CRA Charitable Registration Number both to login and on the application form. You can take a look at the application form in its entirety in this PDF. We recommend that you maintain a document of your responses as back-up to the online content. You can also prepare responses in an off-line document and cut and paste into the application. Please complete all questions on the application form. If you cannot complete the entire form in a single session, you can click Save & Submit Later and a version of your application will be saved. You will receive confirmation that your application has been saved by email and you will be able to return to the saved version in order to complete and submit it later. Once you have completed the online application form, click on the Review & Submit button. You will be required to review your application one final time, including the attachments, before submitting. If you have missed any of the required fields, a red error message at the top of the page will indicate which ones have been missed. Upon submission you will receive a confirmation message and email indicating that your application has been received. 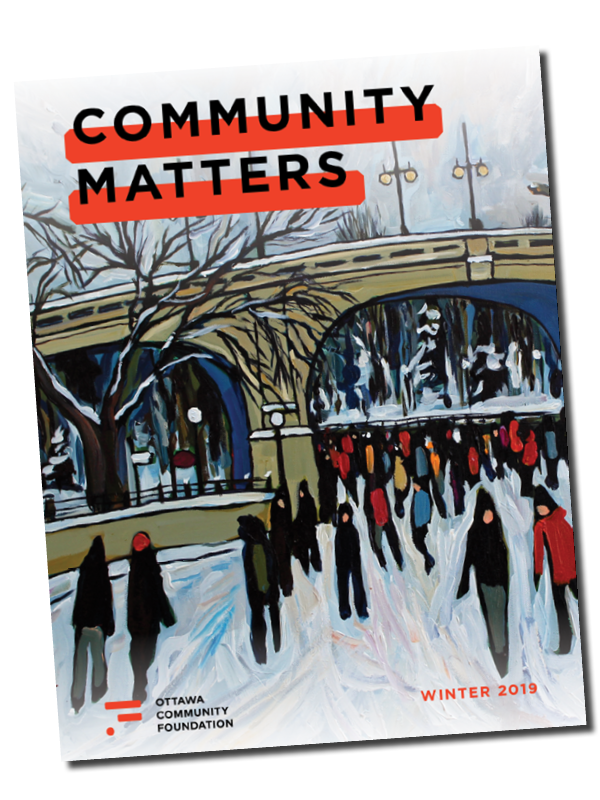 To log out, click the Exit – Sortie link, which will take you to the Ottawa Community Foundation’s homepage. The Partnership Agreement Form is to be completed only by applicants who are not-for-profit organizations without charitable status, and who are applying in partnership with a qualified donee (registered charity). We will accept only one application at a time from an organization. However, a charitable organization can submit an application on its own behalf, and sponsor an application from a partner organization, in the same grant round. Organizations should complete projects previously funded through the Ottawa Community Foundation and submit an evaluation report before re-applying. To obtain the grant evaluation report template click here. The Grants Committee reviews only the information in the application and budget. (Other attachments are used to confirm eligibility.) If you wish the Committee to know about letters of support, client comments, evaluated outcomes of past initiatives, etc.., please reference and/or quote from those in the application itself. If you believe it is important that we have such documents on file, please submit them separately from your grant submission to grants@ocf-fco.ca. We only accept applications submitted through our online granting system. Once submitted, grant applications go through a three-step process. First, they are evaluated for eligibility by OCF staff. Second, they are reviewed by the Grants Committee. Finally, applications approved by the Grants Committee are matched with funding. The period from the application deadline to the notice of decision to applicants is about 2-3 months. This means that applicants submitting for the February 1 deadline usually receive notice by late April, and applicants for the October 1st deadline usually receive notice by early December. Unsuccessful applicants may receive notice earlier. Successful applicants are requested to contact the OCF when they are ready to proceed with their project or initiative, at which point we forward the approved amount. Grantees have up to 6 months from the date of the decision notice to claim the grant.